BCCI has released a partial schedule for IPL 2019 keeping in account the general elections which will be held in April to May 2019. 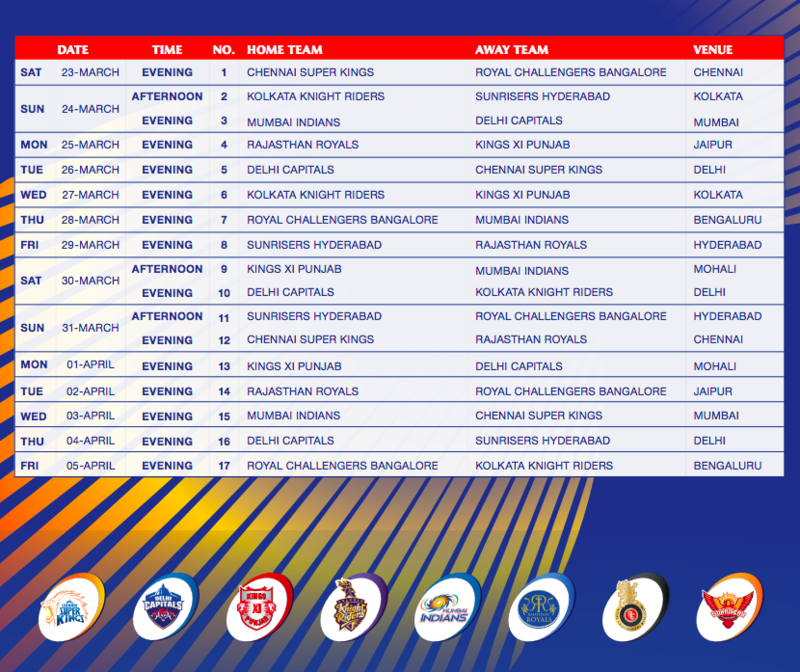 This initial IPL 2019 schedule consists of 17 matches which will be played in India from 23rd March till 5th May 2019. IPL 2018 champion Chennai Superkings under the captaincy of MS Dhoni will start IPL 2019 at the Chepauk stadium in Chennai by playing against Virat Kohli led Royal Challengers Bangalore. The opening match promises to be a cracker with stars like Kohli Dhoni from India and international stars like Shane Watson and AB Devilliers also will play a crucial role for their respective sides. The 12th edition of IPL 2019 will be broadcasted in India through Star India on the Star Sports channel and IPL fans can also catch the live action online on their smartphones and laptops by watching the IPL 2019 live streaming online via the hotstar website and hotstar app to watch all the live action of IPL 2019. If you are living outside of India and are interested to place bets for IPL matches legally You can also try Forex trading to bet on the IPL matches Click here or visit this website to get the best rates on leading currencies. Thank you so much for this information. Your blog is just amazing. This was good read. IPL cricketing info i needed. Spot on ! It has pretty much everything and without the hassle of too many ads or popups. check out.